Paige Dolecki - Stampologist: Use Your Stash Blog Hop - All that Glitters! Use Your Stash Blog Hop - All that Glitters! Welcome to April's Use Your Stash Blog Hop - All that Glitters! If you came from Sheila's Blog you are on the right track! I decided to make a welcome home sign for my daughter who is almost done with her first year of college at Washington State University! She'll be home in just 18 more days and I couldn't be more happy or excited to have her back for the summer! WSU's colors are crimson and gray so I used those for the glitter pieces and added some of our patterned Paper Fundamentals (Adventure and Whimsy) for the balloons. The red paper is from another manufacturer but the rest is CTMH Glitter paper. Plain black cardstock seemed a little too bland and a full sheet of glitter paper was too much but strips of .5" and .25" of Black Glitter paper alternating in the background gave interest and grounding without overwhelming. Love it! I keep every little scrap of my glitter paper because sometimes small jagged pieces work great for bits of backing glitter like I used on the balloons here. The string is some adorable silver baker's twine I picked up a while ago. It frays like crazy but I love the metallic look! Here is a side angle so you can see some of the dimension. I have a deep set 12x12 scrapbook frame I use for my 3-D home decor projects. I keep my projects in an album and pull out the theme or holiday sample I want to use and then pop it into the same frame. I used all CTMH cartridge cuts for this piece - mostly Art Philosophy and Artbooking. Here is the Explore Design Space file if you are interested in cutting one of these cuties for yourself! Now hop on over to Janet's Blog and see what glittery creation she has made to share today! So pretty! I really love the little touch of glitter paper behind the balloons. It really makes them stand out a bit more. I know your daughter is going to love it and cherish it! Very cute! She will love it. That's a lot of glitter....but it all works together great! Love the strips in the background. 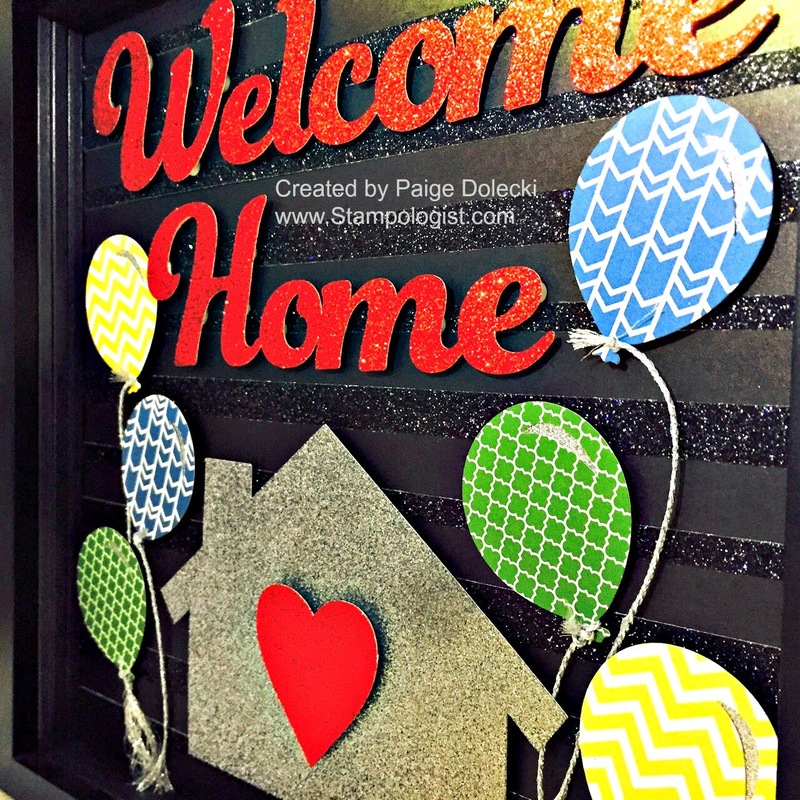 She will love this welcome sign! What a fabulous greeting! It sparkles, shines and says love to your daughter. I love this! What came in my $150 Grab Bag - Quick video! Wa-hoo! My First Grab Bag Arrived!